Save Marinwood-Lucas Valley - our community, our future: Why are 500+ acres at St Vincents/Silveira Ranch an Affordable Housing Combining District? 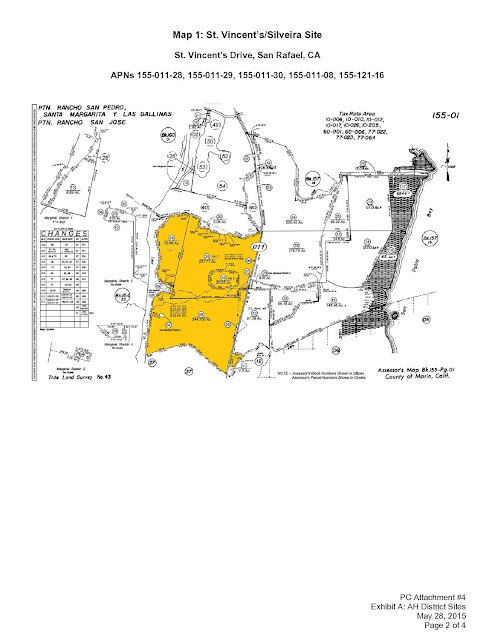 Why are 500+ acres at St Vincents/Silveira Ranch an Affordable Housing Combining District? Viturally all of the land from the 101 freeway to the Smart Train line has been given the Affordable Housing Combining District designation. This is well over 500 acres and coincides with the imagined development that Peter Calthorpe envisioned in the 1980s. The Smart Trail is over a mile to the east from 101. This is a HUGE area that has the potential for thousands of units of affordable housing at 30 units per acre. It easily could DOUBLE our area population. But the Community Development department is telling us than they "only 3.5 acres is needed to build 224 units of housing." Curious, I began to ask questions. "Why is so much land set aside for affordable housing? " "How much land will be set aside for essential commercial services, schools, and other dwelling types?" I was told to consult the County Plan and the Housing Element for answers (500 pages of planning goobledy gook). "You are interpreting it wrong" they told me. "Okay", I said, "then please point out to me the exact language that limits development to 3.5 acres I did not receive a cogent response. Why do YOU suppose they want to set aside so much land for their plans? Why can't they state their plans explicitly? See the staff report from May 28th and for June 22nd. Trust us. We are planning for the future of Marin.